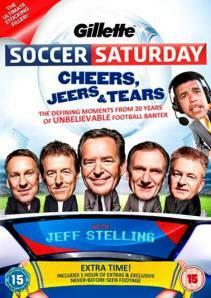 Next year Jeff Stelling will celebrate his 20th anniversary in the hot seat of Sky Sports Soccer Saturday. The Saturday afternoon programme has become an institution for all sofa surfers over the years and has produced many fantastic and memorable moments. The concept, taken from Italian television where TV coverage on terrestrial TV meant they could only describe what was happening on private streams of the games, rather than being able to show the games themselves has become as bigger part of our game today as Ceefax page 303 was thirty years ago. To celebrate the anniversary, Anchor Bay have teamed up with Sky Sports to produce a DVD called “Cheers, Jeers and Tears”, just in time for Christmas, of the best moments of the last twenty years, available in all good retail establishments on Monday 11 November. The DVD, presented by Stelling himself includes some of the funniest moments in the show, although few can come close to matching the incident in April 2010 when Chris Kamara refused to believe a player had been sent off in the game he was covering at Fratton Park. Include your name and address in the email and we will pick three correct entries on Monday 11 November at 5pm.